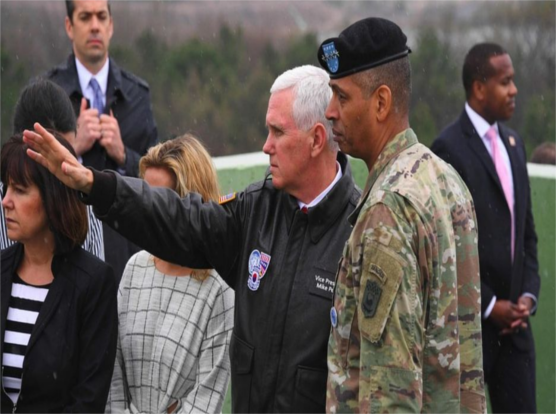 Mr Pence first made the remarks at the demilitarised zone (DMZ), the area dividing the two Koreas, during a visit to South Korea to reaffirm ties. His visit comes amid escalated tensions on the peninsula, with heated rhetoric from both North Korea and the US. He arrived in Seoul on Sunday hours after North Korea carried out a failed missile launch. On Monday, the US and South Korea launched a joint air force military exercise to ensure readiness against North Korea, according to South Korean media. Mr Pence, whose father served in the Korean War, visited the truce village of Panmunjom, where the war's armistice was signed. Speaking alongside South Korea's acting President Hwang Kyo-ahn later, he said North Korea had conducted nuclear and missile tests as the previous US administration had observed a policy of "strategic patience", but this was now over. He reiterated US support for South Korea, telling his host: "We are with you 100%". Mr Hwang hailed the early deployment of the controversial US missile defence system (known as Thaad) designed to protect against threats from North Korea. The US vice-president said he was disappointed that China had taken retaliatory actions against South Korea in response to the move. Mr Pence's latest comments echoed those made by Secretary of State Rex Tillerson, who warned that pre-emptive military action was "on the table" when he visited the DMZ last month. Mr Pence earlier went to Camp Bonifas, a United Nations military compound near the DMZ. Mr Pence is visiting South Korea, Japan, Indonesia and Australia on a 10-day Asia tour. On Sunday, Lt Gen HR McMaster, the US top security adviser, said his country was working on a "range of options" with China, the first confirmation the two countries were co-operating to find a solution to the North Korean issue. US President Donald Trump also said on Sunday that Beijing was "working with us on the North Korean problem". He had stated last week that the US and its allies may "deal with" Pyongyang if China did not.